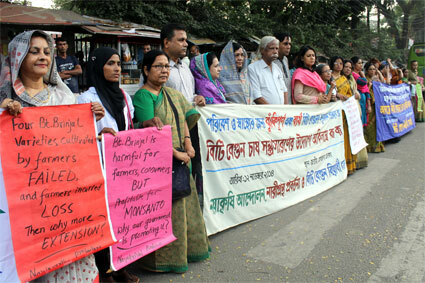 The environmental, farmers and women’s groups are outraged at the news that despite the failure of the first field cultivation scheme, the government of Bangladesh has taken a programme to distribute saplings of genetically modified Bt brinjal among over 100 farmers. Dr. Rafiqul Islam Mondol, Director General of Bangladesh Agricultural Research Institute (BARI), told The Dhaka Tribune “We selected 106 farmers in 17 districts to distribute the saplings. The distribution began in October 2014”. Each farmer is given saplings of two varieties for half bigha (16.5 decimal) land, though BARI initially decided to suggest one bigha (33 decimal of land) for each variety. (see BARI moves to pularise BtBrinjal in Dhaka Tribune ). In a protest rally held on 12 November, 2014 members of Coalition against Bt Brinjal, Nayakrishi Andolon and Narigrantha Prabartana demanded immediate withdrawal of the approval and to stop the distribution of saplings to farmers in newer districts and to newer farmers. Genetically modified Bt. Brinjal is a curse for the farmers and for the consumers. Dr. Zafrullah Chowdhury an eminent physician in Bangladesh called it a “poisonous brinjal”. It is promoted in Bangladesh to serve the interest of the multinational company Monsanto-Mahyco and not for the well-being of the people or the farmers. Despite protest throughout 2013 before and after approval by the National Biosafety Committee (NCB) under the Ministry of Environment & Forest, four Bt.Brinjal varieties were released for field cultivation through 20 selected farmers in four districts. on 12th November, 2014 a human chain was organised by Coaltion against Bt. Brinjal, Nayakrishi Andolon and Narigrantha Prabartana demanding immediate halt to expansion in new areas. The field cultivation miserably failed to bring any positive outcome. Farmers incurred financial losses by cultivating Bt. Brinjal; they could have earned approx. 100,000 taka (USD 1400) if they cultivated local varieties. The promoters of Bt. Brinjal promised that it will be free from fruit and shoot borer (FSB) pest, yet the fruits and leaves were all affected by pest. Most importantly, the farmers were advised and had to use ‘prescribed’ pesticides for the cultivation of Bt. Brinjal. Sixteen out of 20 farmers, who cultivated Bt Brinjal in 0.3 acres of land each, incurred severe loss, four farmers under intensive supervision of the BARI officials reported of limited success. In two cases they sold Bt. Brinjal in the markets but without any labels. According to a condition imposed by the National Committee on Biosafety, as a GM crop Bt. Brinjal must be labeled before selling. But the farmers were found to be selling Bt. brinjals in the market, without any label. They were not even aware of such conditions. The Director General, Dr. Rafiqul Islam Mondol has been even refusing the plan for labeling from the beginning, disregarding any safety concerns of the consumers. In interviews with the journalists of daily newspapers (New Age March 14, 2014) and latest on November 3 to the Dhaka Tribune said ‘it would not be possible to maintain labeling while selling the brinjals. It would be ridiculous’. No one in Bangladesh will dispute the fact that the 2014 field cultivation was a “failure”. But now BARI is distorting the facts in a different direction. The DG said, “While 15 out of the 20 farmers who planted Bt Brinjal have seen significant increase in the marketable yield; the produce of five farmers were impacted due to disease attack at the seedling phase. But the disease was caused by pests other than the fruit and shoot borer (FSB),” (see 'More Bangladeshis to Eat BtBrinjal' in The Daily Ittefaq, September 1, 2014). DG's statement is a complete lie. BARI has also demonstrated that it is not able to monitor the minimum requirements of the approval conditions that were given by National Committee on Biosafety. All the farmers who were selected for the first round of field cultivation were monitored by the BARI regional research stations, yet 16 out of 20 farmers have incurred loss by not having adequate yield. There were pest attack on leaves and fruits proving the claims of Bt. Brinjal to be free from pests and that it is free from the use of pesticides are false. The farmers not only disclosed these facts to the journalists and activists, but also to the officials at the formal meeting organised by BARI about the performance of the field cultivation. Then on what ground the second round of seed distribution programme is undertaken in 5 times more farmers (106) and in 4 times more districts (17) districts! It only shows that actually the first round of field trial was not meant to see the performance but to take a step by step measure to expand cultivation of Bt. Brinjal in the brinjal growing fields of Bangladesh. It is a blue print for agro-business aggression. The second round of field cultivation plan is based on false claims by the government and the ISAAA. The International Service for the Acquisition of Agri-biotech Applications [ISAAA Brief 47-2014] has given a report on the performance of Bt. Brinjal but there is no report published by BARI about the performance of first round of field cultivation. The complete silence is an utter surprise. ISAAA considers the decision to approve the official release of four genetically modified Bt brinjal for seed production and initial commercialization as a ‘historic’ decision. Why is it historic? Is it because it could get the approval in one of the three countries where Bt. Brinjal trial was started but failed to get approval in India and the Philippines? Bangladesh’s unstable political situation was just right time to get it approved! The 20 small brinjal farmers were given saplings on 22 January 2014, thus became the first “unfortunate” Bangladeshi farmers to plant Bt brinjal in 2.6 hectares in four districts of Gazipur, Jamalpur, Pabna and Rangpur. The first four “approved” Bt Brinjals are i. Bt Brinjal-1 variety, (original name Uttara); ii. Bt Brinjal-2 (original name Kajla); iii. Bt Brinjal-3 (original name Nayantara); and iv. 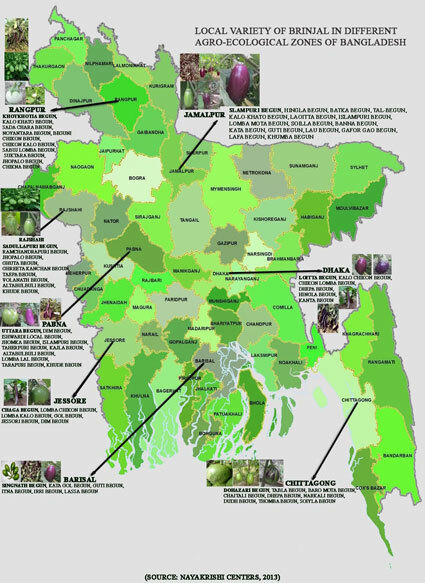 Bt Brinjal-4 (original name Iswardi/ISD006) were distributed in Pabna, Rangpur, Jamalpur and Gazipur. The beautiful original names of the brinjals became just numbers like prisoners as patented by the company. The Bt. brinjal map on the left is taken from ISAAA, which shows different strategic areas with specific varieties genetically modified into Bt.Brinjal; these are areas where Bt. Brinjal research is conducted. On the right, the map is created by UBINIG to show that there are many other varieties which are threatened by the introducttion of Bt.Brinjal varieties in those areas. Almost in all the districts of Bangladesh, some special indigenous varieties have been developed over the years by farming communities through their inventive talent and understanding of local eco-systems. In a country rich in such diversity of brinjals, introduction of genetically modified Bt. Brinjal poses a big threat to biodiversity. The seeds for Bt. Brinjal are planned to be given in October-November, 2014 - the winter crop season commonly known as Rabi season. The BARI chief claims that ‘this time farmers will not face any difficulties as “October-November is the appropriate season for brinjal cultivation.” Last time it was given in January, considered to be late for planting. Among the 17 districts are Kushtia, Meherepur, Jessore, Tangail, Manikganj, Dinajpur, Comilla etc. This complete list is not yet available. Contacting the farmers in the first batch of Pabna, Rangpur and Jamalpur, it was known that those who incurred loss were contacted by BARI but they did not want to take the new saplings. In Jamalpur, one Horticulture official informed that a new plan for distribution of Bt. brinjal saplings has been made, but he did not have the plan sheet yet. He anticipated that more farmers were listed under the new plan. In Kushtia, a meeting was organised at the Agricultural Extension department on 8th November, 2014 with 60 farmers from Pabna, Kushtia and Meherpur districts. No journalist was invited in this meeting. The information was given by one of the farmers from Pabna who attended the meeting. The participant farmers were given Tk.1300 (19 USD) for attending the meeting. The BARI regional office located at Ishwardi, who was responsible to monitor the field cultivation of Bt. Brinjal did not get any responsibility for the new extension. The On-Farm Research Divisions of Pabna and Kushtia are preparing the list of the farmers. Farmer Rahmat Ali, of the first batch could not reap any benefit, so he refused to take new saplings. Yet he heard that the list includes his name along with three new farmers from his village. He is being asked again and again to take the saplings. Another farmer, Amjat Hossain from Pabna Sadar said, he might try in 5 decimal land if they give compensation for the loss incurred last time. Peyara Amzad (or Guava Amzad, because basically he runs a guava and litchi garden) was one of the few favourites of BARI selected farmers and he claimed success in his Bt. Brinjal cultivation. Although our visit to his farm showed poor performance. He is in the new list of farmers and was invited in the Kushtia meeting. However, he could not go for personal reasons. Another farmer Sumon (of the first batch) had bad performance and is not included in the new list. In Jamalpur, Babul Khan is included in the new list of 13 farmers from his village Khanpara. But he is not interested. He told them, “Please do not call me again”. In Rangpur, two farmers of the first batch already said they will cultivate Bt. Brinjal this time. One of them wanted to get an “Indian variety of brinjal” while the other already cultivated cotton in his field. These few examples clearly show that the government is trying to get farmers from first batch according to their own selection, but most of them are not interested in cultivating Bt. Brinjal anymore. Those in the list, are not found to be enthusiastic about it. If Bt. Brinjal was successful and popular, then farmers would have cued in front of BARI office to get the saplings. But the situation is opposite. BARI is looking for the farmers and alluring them to get the saplings. It means, the new farmers are not getting complete information about the Bt. Brinjal and its potential impacts. APPROVAL FOR FOUR, BUT WHY TALK ABOUT NINE BT. BRINJALS? Bt Brinjal is a genetically engineered eggplant. The genetic engineering has been done by inserting a crystal protein gene, Cry1Ac from a soil bacterium called Bacillus thuringiensis (Bt) into the genome of brinjal cultivars. The insertion of the crystal protein gene, along with other genetic elements, such as promoters, terminators, and antibiotic marker gene into the brinjal plant is accomplished by using an Agrobacterium-mediated gene transformation. After conducting field trials with the Bt brinjal varieties developed by Mahyco for seven years from 2006 to 2013 at the farms of regional stations, Bangladesh Agricultural Research Institute (BARI) placed its application to the National Technical Committee for Crop Biotechnology (NTCCB) under the Ministry of Agriculture requesting its recommendation to the National Committee on Biosafety (NCB) for cultivation of four Bt brinjal varieties (Bt brinjal Kajla, Bt brinjal Uttara, Bt brinjal Nayantara and Bt brinjal ISD-006) in farmers’ fields in July 2013. As there are no accredited modern laboratories at BARI or elsewhere in Bangladesh for testing the toxicity and other relevant bio-safety parameters of Bt brinjal, BARI submitted the Mahyco-Monsanto’s self-assessed dossier on toxicity to NTCCB for evaluation. 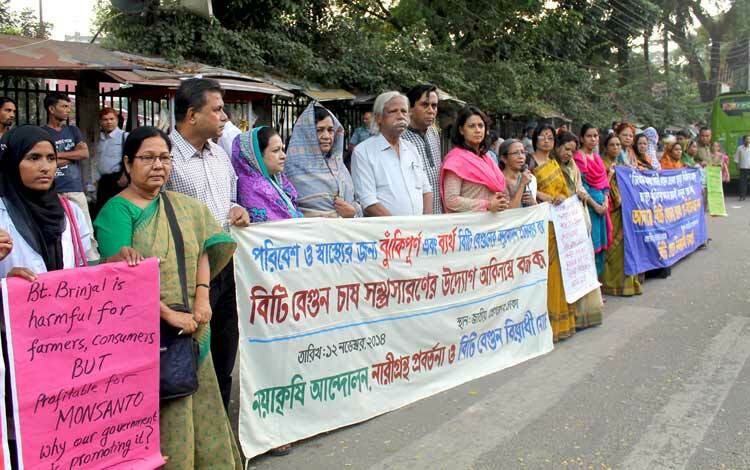 There were protest rallies, appeals of international bodies, environmentalists and scientists, court cases to stop approval, but government ignored them all and BARI was given approval on October 30, 2013 by the National Committee on Biosafety (NCB) Environment Section-2 of the Ministry of Environment and Forest in a notification (in Bengali) vide circular No.22.00.0000.073.05.003.2012-271 to cultivate four Bt brinjal varieties at the field level by maintaining seven conditions. The formalities for cultivation of Bt. brinjals in farmers’ fields were completed when the Minister of Agriculture Begum Matia Chowdhury handed over the seedlings of Bt brinjals on January 22, 2014 to 20 farmers of four regions of Ishurdi, Gazipur, Jamalpur and Rangpur for cultivation in their fields. Intensive observation of the field cultivation by the environmental and farmers groups showed that BARI could not ensure compliance of the seven conditions and particularly on the labeling of the Bt. Brinjal before marketing and to provide documents about the biosafety. 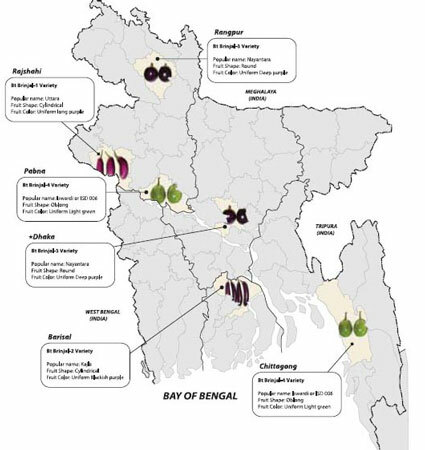 According to ISAAA brief 47, “The Bangladesh Agricultural Development Corporation (BADC) in collaboration with BARI has undertaken seed multiplication of four Bt brinjal varieties to be distributed to farmers in the forthcoming Kharif season 2014.” It also claims that by the next year, Bt gene will be introduced in five other popular brinjal varieties including Dohazari, Shingnath, Chaga, Islampuri and Khatkatia to meet the growing requirement of Bt brinjal seeds which will be planted in different brinjal growing areas. Notably, in the next five years, the government of Bangladesh plans to bring 20,000 hectares or approx. 40% of total 50,000 hectares across 20 districts under nine Bt brinjal varieties”. The question is will the National Committee on Biosafety give approval for five other Bt. Brinjals after the failure of the four Bt. Brinjal varieties? 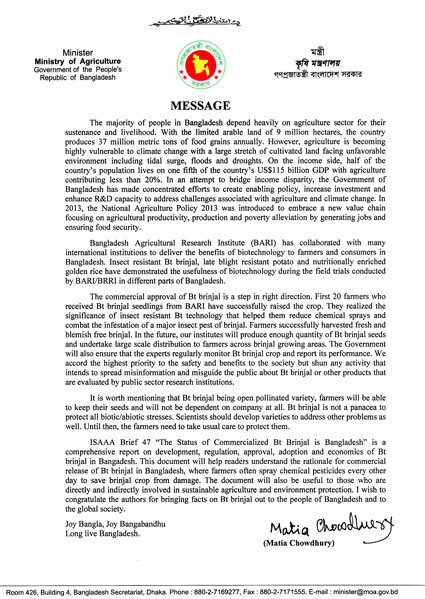 It is quite heartening to see that the Minister for Agriculture of a sovereign country like Bangladesh gives a Message in the ISAAA Brief 47 called "The Status of Commercialized Bt Brinjal in Bangladesh". The Message is “the document will help readers understand the rationale for commercial release of Bt. Brinjal in Bangladesh, where farmers often spray chemical pesticides every other day to save brinjal crop from damage. The document will also be useful to those are directly or indirectly involved in sustainable agriculture and environment protection” It is a well known fact that the threats posed by GM crops are on environment, biodiversity and health. Bangladesh being in the centre of origin for brinjals must not allow genetic modification in this crop. It is an irony that the Agriculture Minister of Bangladesh finds GM crops useful for sustainable development and environment protection! In the face of concerns of health hazards, the government tasked the Bangladesh Council of Scientific and Industrial Research (BCSIR) in December 2013 to analyse if the varieties had any negative health impact. The report is yet to be prepared. Why is this delay? The important question is that the approval is for four varieties, then how the nine varieties are planned for cultivation? According to the Tripartite agreement in 2005, the Intellectual Property Rights of these nine varieties lies with Monsanto, not with BARI. So who plans for cultivation and the amount of land to be brought under Bt. Brinjal cultivation? SMUGGLING BT BRINJAL TO INDIA FROM BANGLADESH! A news item in Hindustan Times (November 10, 2014) had a headline “After terror, Bangladesh sends Bt seeds into India” drew attention of both the anti-terrorist group as well as anti-GMO groups. Bt. Brinjal is now compared with smuggling of terror into the soil of India. Journalist Joydeep Thakur writes, “Terror is not the only commodity that is entering Bengal through the Bangladesh border. At a time when controversies and debates over the introduction of genetically modified (GM) crops are raging in the country and the scientific community is yet to give its opinion, Bt Brinjal seeds are being smuggled into West Bengal and farmers in the state are believed to have sown the crop in several districts”. The report claims that seeds of Bt Brinjal are being smuggled into the country through the Indo-Bangla border in West Bengal. The smuggling is being reported from bordering districts such as Nadia and Murshidabad. THe district officials are asked to remain alert and investigate the matter. Bt Brinjal, from seeds brought in from Bangladesh, is now being cultivated on the banks of river Ajoy that flows between Birbhum and Burdwan. Thus Bt. Brinjal is now a biological terror spreading within the country as well crossing border, may be even fly over to Europe and other countries of the world! Lets stop it without further delay.